Over the past few months, we've seen Deadpool celebrate Halloween, Thanksgiving and Christmas in his own unconventional way. Now that the NFL playoffs are in full swing, the Merc With the Mouth is back with a new TV spot, which showcases his own unique take on the game with "Canadian Rules Football.' The video shows Ryan Reynolds' title character seemingly lining up a "field goal," only to kick one of his enemies square in the head. Coincidentally, the video comes just a few days after Minnesota Vikings kicker Blair Walsh missed a chip shot field goal that would have won the game against the Seattle Seahawks. 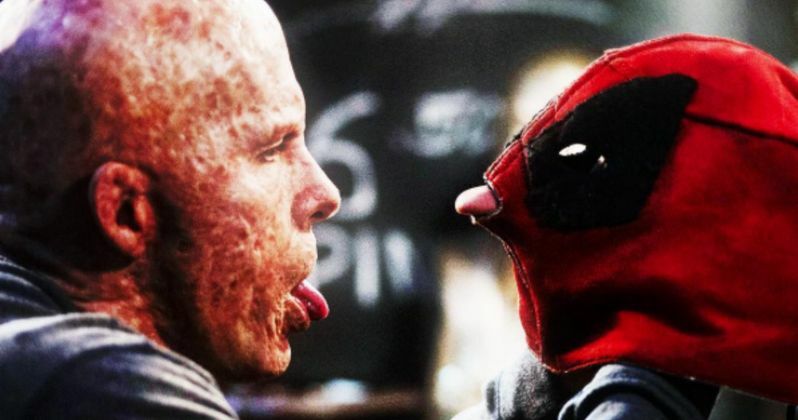 If that wasn't enough, star Ryan Reynolds has also debuted two new photos on his Instagram page, which shows Deadpool's bizarre method of saving a cat from a tree, and Wade Wilson literally sticking his tongue out while gazing at his Deadpool mask. Yesterday, we also showed you a banner that tried to promote this superhero action-adventure as a romantic comedy, since it opens on Valentine's Day weekend, and today we have two more romance-themed posters with Wade Wilson and his girlfriend Vanessa Carlyle (Morena Baccarin). Based upon Marvel Comics' most unconventional anti-hero, Deadpool tells the origin story of former Special Forces operative turned mercenary Wade Wilson, who after being subjected to a rogue experiment that leaves him with accelerated healing powers, adopts the alter ego Deadpool. Armed with his new abilities and a dark, twisted sense of humor, Deadpool hunts down the man who nearly destroyed his life. Deadpool is slated for release on February 12, 2016, going up against Warner Bros.' How to Be Single and Paramount's Zoolander 2. Ryan Reynolds stars as the Merc With the Mouth, with a supporting cast that includes Morena Baccarin, Gina Carano, Ed Skrein, T.J. Miller, Brianna Hildebrand, Olesia Shewchuk, Style Dayne, Rachel Sheen and Dan Zachary. Tim Miller makes his directorial debut with Deadpool, working from a script by Rhett Reese and Paul Wernick. Deadpool is based on the Marvel comic book series created by Rob Liefeld. Take a look at the new banner and Ryan Reynolds photo as we continue the countdown towards Deadpool. What remains to be seen is if 20th Century Fox will actually plunk down some big bucks to promote Deadpool during the Super Bowl. The cost of a single 30-second TV spot is reportedly $5 million this year, so we'll have to wait and see if the studio has any plans for the Merc With the Mouth to invade the big game, which airs Sunday, February 7 on CBS, just five days before the movie hits theaters.